Should you rent an RV before buying one? If you have never owned an RV, the answer is a resounding YES. Think about it, when you bought your last car, did you test drive it? When you bought your last pair of shoes, did you try them on to make sure they were comfortable? Hopefully you answered yes to both of these questions. 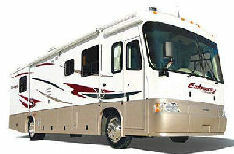 Buying an RV is just like buying a pair of shoes, except you are going to be spending a lot more money on the RV. Right now, I am sure that you are really interested in RVs and the RVing Lifestyle (that is the reason you are on this website right?). You want to buy an RV but you have questions. Renting an RV will answer these questions. O.K. we convinced you that RV rental is a good idea. So, where can you rent one? Depending on which type of RV you want to rent there is information you need to know. Renting a Motor Home: What you need to know if you want to rent a Class A, Class B or Class C Motor Home. Renting a Trailer or Truck Camper: What you need to know if you want to rent a 5th Wheel Trailer, Travel Trailer, Tent Trailer or Truck Camper. Trying before buying will help prevent buyers remorse.